Most Sturmey Archer hubs with more than three speeds use compound (stepped) planet gears with two or more sets of teeth --each set has a different number of teeth. One set engages the gear ring; each set engages a different sun gear. These hubs all have odd numbers of speeds: the unity ratio, and pairs of higher and lower speeds achieved by locking each of the different sun gears to the axle. The 8-speed hubs and the newest 4-and 5-speed hubs (not yet released in the USA) are constructed differently, with planetary stages one after the other. any mechanics are scared of internal-gear hubs, and think of them as being impossibly complicated. Even if you are too chicken to try taking an internal-gear hub apart, that shouldn't stop you from working on bikes that use them. The classic Sturmey-Archer AW hub is the most reliable gear-shifting mechanism ever made, and rarely needs anything more than a bit of medium-weight oil every so often. 95 percent of shifting problems on 3-speeds are related to the control cable or the shifter. ttachment of the cable to the classic three-speed trigger control is covered in a file of its own. Most Sturmey-Archer three-speeds other than the S3x fixed-gear can use the trigger control, though another shifter may be supplied with the hub. It is hard to beat the trigger control for durability and secure engagement. The trigger not only indexes, it latches. ost Sturmey-Archer hubs have a little chain coming out of the right end of the rear axle, to which the end of the control cable attaches. This chain (called an "indicator spindle" by cognoscenti) screws into an internal part of the hub by rather delicate threads. There are several lengths of indicator spindles. A range of lengths will work with most hubs (see adjustment procedure below). We have a page listing the various indicator spindles, giving their part numbers and lengths. 1940s-1950s four-speed Sturmey-Archer hubs have a special two-part indicator spindle. The axle of these hubs is hollow at both ends. Some five-speeds have a second indicator spindle on the left side. The axle of these hubs also is hollow at both ends. 7-speeds, 8-speeds and a few newer three- and five-speeds have rotary shifting. The cable wraps around a pulley concentric with the hub's axle, and the axle is not hollow. There is no indicator spindle. These variations are covered in the instructions for specific hubs. When you install an indicator spindle, screw it in finger-tight, then back it off until it faces the cable. So that it can swing freely to face the cable, it should not be bottomed out on its internal threads. This adjustment must be checked every time the cable is re-attached. 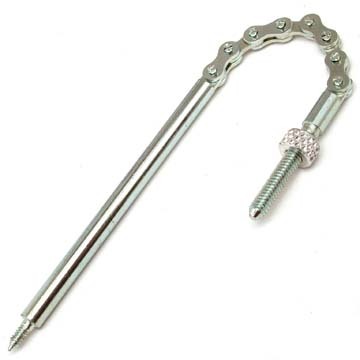 The fine adjustment of the cable pull is accomplished by how far the sleeve at the end of the cable screws onto the threaded stud at the end of the indicator spindle's chain. The official manuals tell you to adjust it by visual examination of the end of the indicator spindle shaft, but this doesn't always work, especially if the indicator spindle is not original equipment. For best results, adjust the cable by tension. When the trigger is in high-gear position, the cable should be totally slack. Shift down to middle gear, while watching the indicator chain-it should clearly move as you make the shift. Then shift to low gear; again, you should see more chain coming out of the axle nut. Sometimes the internal parts line up in such a way as to prevent downshifting. If you have trouble getting the hub to downshift, turn the pedals slightly forwards. Once you are sure that the hub is in low gear, take hold of the indicator-spindle chain and try to pull more of it out of the axle. If the adjustment is correct, you should be able to get just a tiny bit more movement from the chain. If it is completely taut, the cable is too tight. Make sure to tighten the knurled locknut on the indicator spindle so that the adjustment will stay as you have set it. On a newer hub with more than three speeds, check for correct engagement in every gear. Double-check the adjustment in all gears. In low gear with most hubs, you should be able to see that the sprocket moves faster than the wheel, the hub should not make a ticking sound while being pedaled forward. In middle gear, the sprocket should move at the same speed as the wheel (direct drive), and you may hear a slow ticking as you pedal. In high gear, the wheel should turn faster than the sprocket. The same slow ticking may be audible in high gear. With the S3X fixed-gear three-speed, you will not hear a ticking in any gear, and the top gear is direct drive. If you hold the trigger halfway between middle and high gear with an older hub, it will disengage so that you can spin the pedals forward without going anywhere. If it freewheels forward in high gear, the cable is to tight or has too much friction to release properly. If it freewheels forward in middle gear, the cable is too loose. Be sure you keep the cable correctly adjusted. If the hub pops out of gear, especially when you are standing to pedal, you could crash, or bang a knee on the handlebar. Different hubs use spindles of different lengths, but there is a lot of compatibility among them. Information on the lengths and markings of indicator spindles is in another article. one adjustments must only be made on the left side of the hub -- but first make sure the right cone is properly in place. On most hubs, before installing the left cone, or with it loose, screw down the right cone until the internal mechanism begins to bind. Then back the right cone off between 1/8 and 3/8 turn, so the mechanism turns freely, and secure the cone with its locknut. This procedure positions the mechanism inside the hub shell. Older hubs use a special tabbed washer between the cone and locknut. Newer hubs with rotary shifting have a more complicated right-side assembly -- follow the instructions specific to each hub. Once you have finished with the right cone, you are ready to adjust the left cone. A properly-adjusted wheel will have very slight play at the rim. If the left cone adjustment is too tight, the pedals will tend to turn forward as the wheel turns. (This same symptom may result if the chain is too tight, or if the right cone has pulled the internal mechanism to the right so it is binding.) A very sensitive test of bearing adjustment with many Sturmey-Archer hubs is to try to tilt the sprocket, rocking it relative to the hub shell. When there is very slight play at the sprocket, there will be no discernible play at the rim, yet the sprocket will still turn freely. It is possible to run this check and make the adjustment with the wheel on the bicycle, if you have loosened the left axle nut. Precise cone adjustment is especially important for clean shifting when using hybrid gearing. hen you remove and re-install a rear wheel with an internal-gear hub, pay particular attention to the axle washers. The axles are flatted, and there are special anti-rotation washers keyed to the flats on the axles. These washers have tabs that must face into the dropouts to help keep the axle from twisting under load. The tendency of the axle to twist is greater the farther the gear ratio is from direct drive (especially for decrease ratios), the larger the rear wheel, and the harder the cyclist is pedaling. Details of this are in our article about torque. There are at least nine different kinds of Sturmey-Archer anti-rotation washers. Axles of almost all Sturmey-Archer internal-gear hubs except some with rotary shifting have a 13/32" (10.3mm) outside diameter, and so the same washers will fit any of these hubs -- but different installations require different washers. The RS-RF3 and RX-RD3 three-speed hubs with rotary shifting have a 3/8" (9.5mm) axle diameter and use different washers. 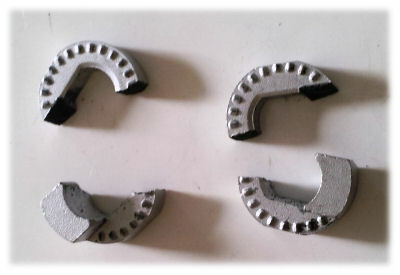 Where part numbers for two washers are given, they are interchangeable, but with newer washers, the higher-numbered one has a Xylan (plastic, anticorrosion) finish. When installed with its back facing a smaller part, an anti-rotation washer will be stressed, and a thin one may bend. It is a good idea to install a thick washer of equal or larger outside diameter behind the anti-rotation washer. Any Sturmey-Archer internal-gear hub with pull-chain shifting can be installed in vertical dropouts if an eccentric bottom bracket is used. The newest (wide-range) 8-speed hub may also be used with vertical dropouts, as the shifter pulley inside the right-hand dropout can be reoriented before installing the hub. A chain tensioner or rear derailer also may be used for chain adjustment, except with coaster-brake and fixed-gear hubs. Sturmey-Archer recommends the HMW515, HMW518 or HMW534 washer for use with short, vertical dropouts, but then the assembly rests only on the washer's tab at one end, and the edge of the axle flat at the other. With most hubs, the assembly will tend to twist backward in the dropout slot in the lower gears, and forward the higher gears. The 8-speed hub has only direct drive and higher gears, and tends to twist the axle only forward, making for a more stable installation. Sturmey-Archer recommends only the thicker washers for use with this hub. However, there has been a report of anti-rotation washer breakage with the 8-speed hub and a heavy cyclist sprinting in a high gear. If a dropout is thick enough, or by facing tabs of single-ended washers toward opposite ends of the dropout slot, two washers may be used at each end of the axle for extra strength-- one inside and one outside the dropout. This trick can be useful with other hubs besides the 8-speed as well. Shimano and SRAM anti-rotation washers do not fit a Sturmey-Archer axle. The axle nuts of internal-gear hubs are easy to strip because of the interrupted threads on the flatted axle, so you should lubricate them with medium-to heavy oil or grease. They do have to be tightened quite securely. A hub with a coaster brake or drum brake also has a reaction arm. This must be clamped to the bicycle's chainstay. It secures only the brake mechanism and does not substitute for the anti-rotation washers. ost Sturmey-Archer hubs are available with different lengths of axles. They are listed in the spec sheets for the various hubs. An axle generally needs to be 1 1/4 inches (31 mm) longer than the bicycle's overlocknut spacing, for full thread engagement with the axle nuts. Another 6 to 10 mm is OK, and may be needed if the bicycle has thick dropouts. Too much axle length on the right side may prevent a flared right-side axle nut from being tightened down all the way, and may interfere with operation of the pullchain. When in doubt, test or measure. Adding a washer under the axle nut can free the pullchain. Different overlocknut distances are accommodated by placing washers between the left bearing cone and locknut, or by locknuts of various thicknesses. It may also be possible to add a washer on the right side. If centering is affected, the wheel may need to be redished. Older hubs had a rather limited selection of axles, as the standard overlocknut spacing was only 114 mm or 120 mm when these hubs were made. Common axle lengths for the classic AW hub were 5 3/4 inches (146 mm) and 6 1/4 inches (159 mm). A 6 7/16 inch (164 mm) axle suitable for 126 mm dropouts was also made for this hub and its near-relatives. The length difference is at the left end of the axle. The right end is the same for all of these axles. Many current hubs are sold with a choice of two axle lengths. odern bikes use grease for lubrication. This is good, because grease lasts a long time, but it is bad because grease can usually only be renewed by disassembling the parts. Sturmey-Archer discontinued the oil cap on its internal-gear hubs in the mid-1980s, though most newer Sturmey-Archer hubs can be oiled by removing the indicator spindle and squirting oil into the hollow end of the axle. If the axle is hollow all the way through, block the other end so the oil is forced into the mechanism. A Sturmey-Archer oil cap (lubricator) can be installed in most hubs, too. Convert to oil lubrication after a rebuild, as some lubricants are incompatible with each other. Some hubs with a coaster brake or drum brake must be lubricated with grease. A drop or two of oil on the moving parts of a 3-speed shifter should also be part of regular maintenance. Please also read the section on lubrication in the main page on internal-gear hubs before rebuilding a hub or converting one from grease to oil.